As diwali on the way ,my hubby wanted alteast 5 special food items for the festival which reminded him of his childhood diwali. (i just asked what u want for diwali?..how will i know he will give a long list..:))So in his list the first item was "Murukku"(Chakli).There are many types of murukku, kai murukku, thenkulal,inippu murukku..etc..the list goes on.My version of murukku is simple 'Arisi mullu murukku' or rice murukku made using murukku press or sevai press.This gadget makes the job very easy.It comes with many discs with thin holes, bigger holes, star shaped holes and flat rectangular holes , easy to make murukku in any shape.I use the same press for savories like kara chevu, omapodi etc. Mix rice flour,urad flour,salt,perungayam,jeera,sesame seeds and butter together into a dough using required water.The murukku dough should not be very soft or very hard.The consistency of the dough is somewhat like that of a cookie dough.Heat oil in a heavy bottomed pan for frying.Now fill the murukku press with the dough. 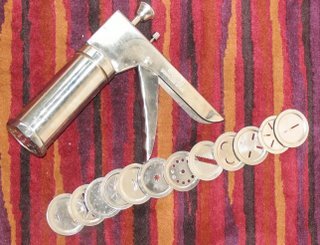 (i selected the star shaped disc for getting this rough edged mullu murukku).Press the murukku press, making circles (or any shape u want) in the hot oil. Fry it until it is golden brown in color and drain oil.Store it in an airtight container.You will be able to keep it for monthes. 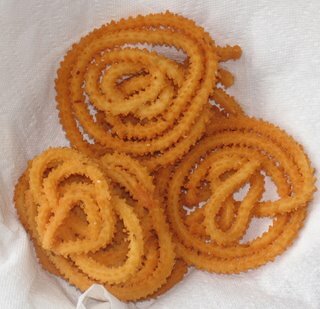 Murukku looks yummy.. this is my favorite. So Diwali is all Set!! I am drooling!! Chakli is fav. snack!! You guys have alredy started cookin for Diwali! !I haven't started yet! !BOO HOO!! First time to your blog.Crawled here through your comment in my blog.List of recipes i will try leisurely. Seeing muruku i smell diwali. I like the combo of lemon rice+coriander chutney.Could you post the recipe for Coriander Chutney? Thank for sending these fabulous arisi murukku Maheswari to VCC. Yet another winner entry! All the best. See you at the show! You need a right tool to make muruku. The job was done like a breeze, just with one hand ! It was so easy to press.